"I enjoy my visits to your web site. Your web site and contests are a lot of fun, and absolutely, one of the most friendliest! Keep up the great work! Thanks again!" 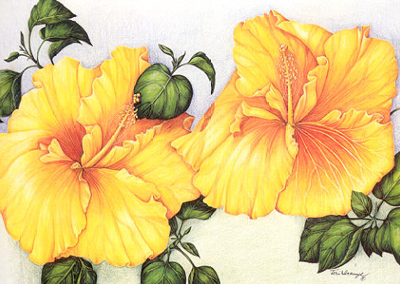 "I received the note cards today and they are all beautiful. They are so realistic that I can picture them in their Hawaiian settings and dream of visiting there again. Thank you so much for this win!" "The gorgeous notecards I won arrived in my New York POB this morning. Thank you! I discovered your website on REDHOTSWEEPSSITES.COM ALOHA!" SCM-HIB5 Double Matted Note Card $13.50 Click here for ordering information (write in the comments section the name of the card you would like). SCK-HIB5 Double Matted Note Card framed in Koa $40 Click here for ordering information (write in the comments section the name of the card you would like).